Bell peppers are appearing by the dozen in neighborhood gardens, which means it’s time to figure out some great uses for them. My favorite use is to take five or so, clean them out, and stuff them with rice and other goodies. 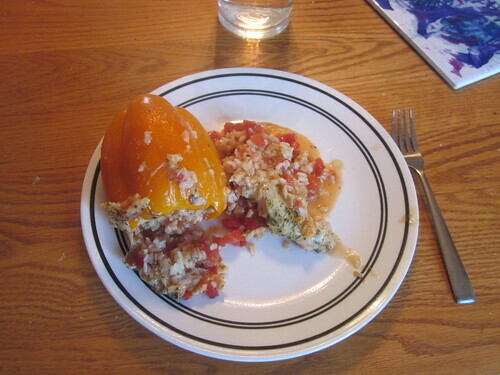 Even if you don’t have a garden of your own, this is still a good time of the year to try stuffed bell peppers, as the key ingredient you need (bell peppers) is often on sale in the grocery store. At least, that’s the case around here, where grocery stores are competing with roadside vendors for sales on the fresh produce that’s coming online. For us, this is a perfect summer rainy day meal. It’s really flexible, takes advantage of fresh vegetables from the garden, and creates a delicious meal with plenty of leftovers. For the exact recipe I’m describing below, all you really need are a few bell peppers, roughly one cup of cooked rice per bell pepper (this is a good opportunity to cook some extra rice for other meals, so don’t hesitate to cook some extra), roughly one small tomato per bell pepper (or one large tomato per two bell peppers), and a bit of cheese (we used a bit of Parmesan and some mozzarella). We also sprinkled some dried herbs (basil and oregano) on top along with some ground black pepper. However, you can stuff these things to your delight. Other ingredients you might use include onions, garlic, mushrooms, spinach leaves – the options are endless. 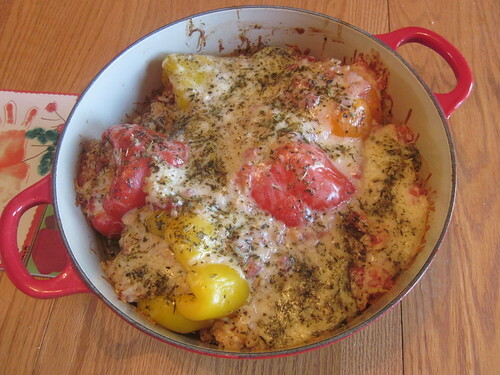 You’ll also need an oven and a good-sized dish to bake the peppers in. I’m using a 5.5 quart enameled cast iron pot for the five very large bell peppers we’re using. If you want, you can do the entire meal preparation the night before quite easily, leaving you to just pull out the dish to bake the bell peppers in the next day. 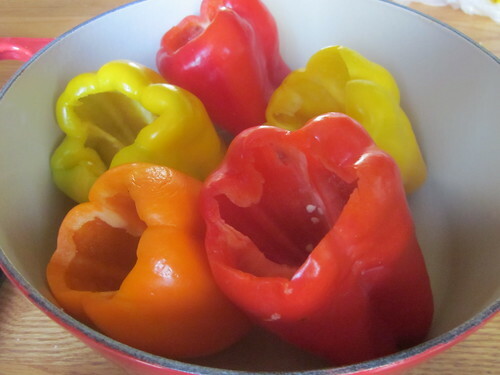 You can also divide up the work into batches by cooking the rice in advance or preparing the complete mix that you’re going to put inside the bell peppers in advance. One thing I would absolutely do in advance, though, is clean out the bell peppers. Cut a hole in the top to remove the stem and allow yourself some room to spoon in some of the mixture you’re going to make, then thoroughly clean the pepper so that you remove excess seeds. First, cook the rice according to the package directions. We used long grain brown rice, but anything will work here. While the rice is cooking, clean and then dice up your tomatoes. I usually try to conserve as much of the juice as possible from the tomatoes when doing this. 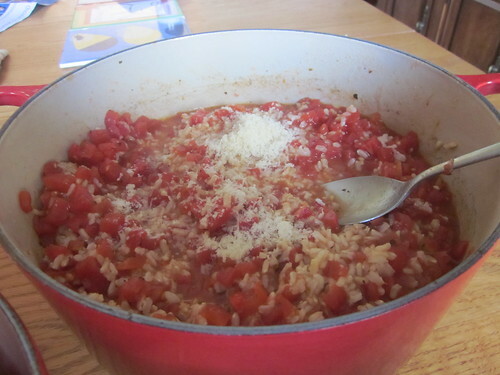 When the rice is done, mix the tomatoes directly in with the rice, along with any additional vegetables or ingredients you’re using, like onions or mushrooms or herbs or some of your cheese. I made plenty here so that we can freeze one batch of the mix to add to peppers again later in the fall, using the last of our peppers from the garden. 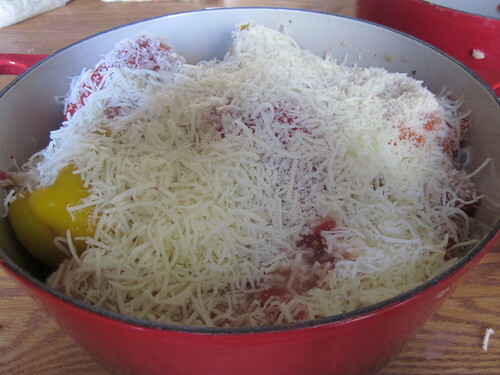 We mixed about 1/2 cup Parmesan cheese straight into the mix. Start spooning that mix directly into the peppers. When the pepper fills up, I like to press down on the top of the mix with a spoon to force out air bubbles, which usually makes room for a bit more mix. Once you’ve stuffed all the peppers and put them in your cooking pot, pour in the rest of the rice mix right in with the peppers if you have a little extra. It will cook just fine. Add any extra ingredients on top (we added mozzarella cheese), cover, and bake at 375 F covered for about 8 minutes per pepper (if the filling was hot) or about 12 minutes per pepper (if the filling was cool because you refrigerated things). Scoop out the peppers (with some of the extra rice) and serve! As mentioned earlier, you can stuff the peppers with any number of things. While I would consistently use some sort of grain to make up some of the bulk of the stuffing, you can use any sort of grain, from long-grain rice to quinoa. You can also add many different types of vegetables to the grain. We used tomatoes, but you could easily add spinach, onions, garlic, radish – any number of things. You can also add spices and cheese to your heart’s content.